Today I thought I would share with you the items that I’m loving right now & my method for keeping an eye on them until a sale pops up! When I am browsing online and find a piece that I love but isn’t in my price range, I save the link as a favorite bookmark into a folder labeled “Sale Stalking”. Then I go back and regularly (about once a week) check those items to see if they’ve been marked down yet. Also, because I update my Sales Page every day, I am always aware of discounts/deals being offered at all my favorite stores, so that helps me too. i have the me too flats and just have to say…for anyone who is considering buying them…they are THE MOST comfy shoes ever. and that's saying a lot for a pointy toe shoe! love them!!! 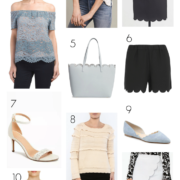 Such a fun list – I love the lace skirt! I've been lusting after the tinley road peplum too! I love that leather peplum top! So gorgeous and affordable!!! I have my eye on those flats too! I'm they are still on sale (and in my size) when I hit the Nordstrom anniversay sale on Friday! These are all great picks! I love both flats….the silver would be so fun! Great picks Kimberly! I have my eye on those Me Too flats too! I almost pulled the trigger a couple weeks ago – but I don't wear flats much so $60 is a little too much to spend. I LOVE the Tinley Road peplum top!! And those black trousers – so you! I want that clutch and the shoes!! These are some great tips and I am going to try some! Cute picks! I do the same thing, but I usually save the links in an email or evernote since I'm not always on the same browser at home – that way I can check at work or from wherever! Hi Kim, I love your blog!! I found this dress at one of my favorite online shops, Ruche, and thought it might be a decent alternative to the Francisco Costa for Calvin Klein Shift dress in your wish list. Love the faux leather peplum top! Then again, I'm a sucker for anything faux leather! 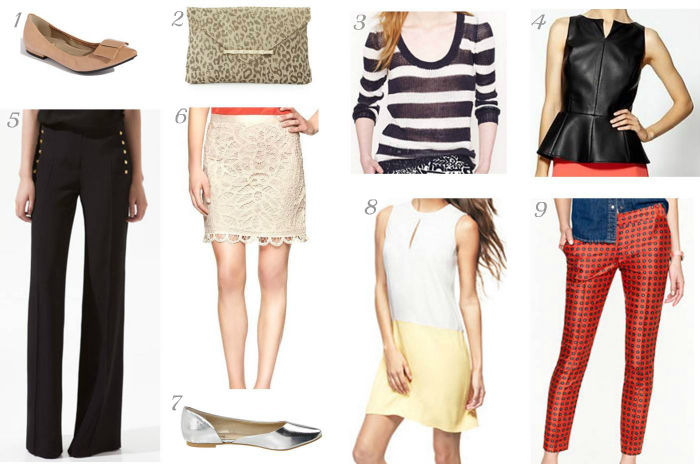 I love the peplum top and the jcrew pants. So cute!! I sale stalk too! Which program do you use to set up those awesome photo collages? 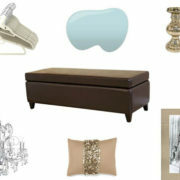 I have a few of these items on my "to watch" list as well! Love those JCrew pants though-the print is so fun! yep, can i please have one of everything? those last pants are absolutely perfect! Kim, where is your sale to watch page? I clicked on the sick and saw all the great sales listed, but is it somewhere on your blog that I'm missing? Great picks! I love the lace skirt! Lindsay, the link is in my right sidebar with the button "Sales Alerts" – it's a page that I update daily with a list of sales and coupons at my favorite stores! Great selection. 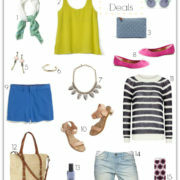 The J.Crew pants and the the peplum top are gorgeous! My eyes were drawn to number four – that's a perfect investment for fall when it's going to be leather leather all around. Very chic! I am in love with that peplum,,, great pics hon! A sales bookmark folder is such a good idea, I need to start one. And I love your wishlist, the silver flats are gorgeous! Looking at all these pieces I can say you have great taste and wisdom. I'm learning so much from you, not only about fashion, but also about saving money… My husband would surely love you.